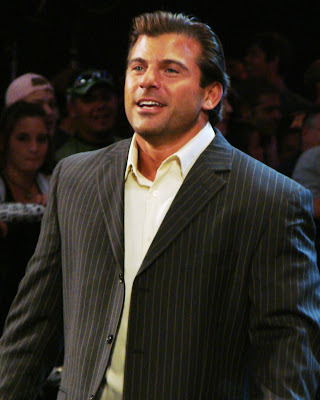 In the second part of this week's Double Header of Interviews it's time to speak to former WWE wrestler and commentator Matt Striker! Hometown: Queens, New York, USA. I was drawn to the sport as a child. My father and I bonded over many aspects that proper pro wrestling can instill. My father would point out the moral lessons within the competition. I, of course, promptly rooted for the rulebreakers! 2. Could you explain a little of the circumstances that led to you leaving WWE and is the door still open for a future return? If I had a mind reading device I would tell you about it. I can only imagine it being a business decision. It hurts for me to explore that maybe they thought it was better business without me. Either way, I too, want whats best for WWE - and wrestling as a whole. If the company saw me as a liability and not an assets - then so be it. Respect. 3. What are your fondest memories of working for WWE, and which are you not so fond of? Fond memories went from competition and performance to stories or laughs that I shared with brothers. In ring memories range from competiting against The Undertaker, Kurt Angle, John Cena and Triple H. Wrestlemania will always be a highlight. I even enjoyed Heat matches with local talent and some of my WWE.Com shows and early app work. I loved NXT and I always cherished doing commentary. Anywhere that I'm allowed to ad lib, improv and be organic are always going to resonate more than anything with me. If that makes sense. Moments of friendships will always be mine to hold onto. Regrets? I don't know... maybe that I didn't get into the ring more often towards the end to remind management that I can contribute in any way they would ever need. Ugh. How can you ask me for three? Haha, How about the three things I'm "digging on" now? I'm very into pinning variations - The whole point of a wrestling match is to pin or make your opponent submit. Som, I'm "digging on" guys like Dos Cares, Mr. Gannosuke and the like. I've been watching a ton of Kurt Angle - as well as World of Sport footage and some Nick Bockwinkel, Karl Gotch - type stuff. I'm very attracted to the "Catch as Catch can" psychology and kinesiology - and how it's applied to pro wrestling. I also am enjoyed the Junkyard Dog lately.... and Jay Briscoe. 5. What's next for Matt Striker and is there any possibility you'll be making your way across the pond anytime soon? Anytime! The sooner the better! I've always felt at home in Britain, I enjoy the culture, the history and of course - the splendid wonder that is British Wrestling. Let the world know! I'd love to come over! Whilst home I am wrestling on the U.S. Inpdependent scene as well as going to wrestling schools and talking to the students and passing on what's been gifted to me. I live near New York Cirt, so I am exploring some stunt work and other acting related ventures, voice-overs, commercials, hosting work, etc. Thankfully, I have my degree so I can seek a return to the classroom as well. Thanks for the interview. Hello to all the great U.K. fans. I hope to see you all again very soon. We'd like to Matt Striker for giving us this fantastic interview.